See for yourself why Wolf Track has the easiest Windows-based point of sale software in the industry. Get your free 15-day, fully functioning copy by submitting your information in the form below. Please be sure to indicate which version of the software you want to evaluate, and remember, a valid email address is required to receive your free software download and installation instructions. You will receive your confirmation email within a few minutes. If you have any questions about our product, please call us at (918) 794-1544 or email us at Support@wolftrack.com. Our staff is standing by to assist you. Thanks again for taking the time to learn more about our software. Please note: Wolf Track products are designed for Microsoft Windows PC's running XP or Vista with a minimum of 1 GB in free storage space. Liquor stores need to be able to quickly check out customers. Wolf Track Software allows them to quickly know what the date of birth is for 21 and/or 18. The date is listed right on the checkout screen. Date of Birth is not only for our liquor store customers. Our video game store are able to take advantage of the feature for easily checking ages for ESRB ratings. 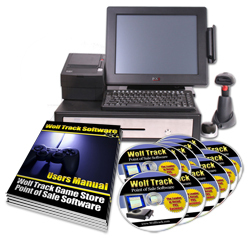 Wolf Track Software is now offering a Hardware/Software Package. Our hardware package includes a computer, cash drawer, scanner, credit card swipe, customer display and even a touch screen monitor.